A feel-good Christmas story for older kids and their parents, Elf trades heavily on Will Ferrell's physical comedy skill set. The film offers good and awkward moments in equal measure in the tale of an out-of-place elf searching for his real dad and trying to reignite the Christmas spirit. As an infant, curious baby Buddy Hobbs crawled into Santa Claus's toy bag and inadvertently made his way back to the North Pole. Raised as an elf, Buddy grew up into a happy if rather dim adult (Ferrell). 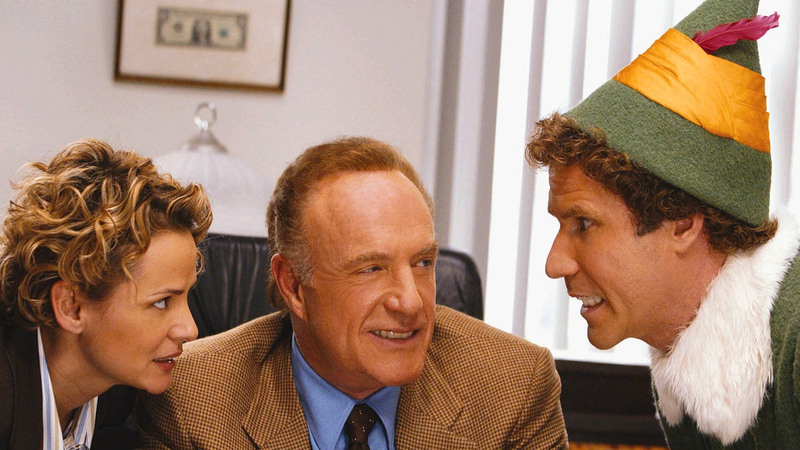 Once he finally realizes that he is a human and not an elf, his adoptive father (Bob Newhart) reveals that Buddy's real dad is New York businessman Walter Hobbs (James Caan). The small problem is that Walter is on the naughty list. Undeterred, Buddy sets out on a journey to find and reconnect with his father. Once in New York he struggles to get to grips with modern society, but quickly finds Walter, a cut-throat book publisher working for a heartless corporation. Walter's wife Emily (Mary Steenburgen) and son Michael (Daniel Tay) eventually warm up to Buddy, although he does manage to wreck their house. Buddy also meets and falls in love with toy department store clerk Jovie (Zooey Dechanel). With the Christmas spirit in short supply and Santa Claus (Ed Asner) struggling to complete his annual toy deliveries, Buddy has to inspire Walter to rediscover his humanity and also help save Christmas. Setting any Christmas story in a decked-out New York is a sure way to gain an immediate advantage, and after a rather tired prelude at the North Pole, director Jon Favreau quickly gets into the spirit of the season with an overgrown-elf-on-the-loose-in-New-York premise. It's an easy pathway to laughs for kids, with the silly moments including Buddy spinning in a revolving door and pressing all the buttons in the Empire State Building elevator. Ferrell also overdoes the eating habits of an elf, which consist of any concoction (including messy spaghetti) where a lot of sugar is added to a lot more sugar. The film is always better when Ferrell's more immature tendencies are coupled with James Caan's easy turn as a crusty businessman happy to play hardball with nuns and knowingly approving the publication of a children's book with missing pages. Also good if a bit obviously fragile is Zooey Deschanel as the love interest, her discomfort with singing in public an obvious set-up for the smarmiest of endings. Favreau gets a lot of mileage by dropping Buddy into the Gimbels toy store where a full mock North Pole set-up is arranged for kids' photos with Santa. Of course as far as Buddy is concerned there is a real North Pole and only one Santa, leading to a couple of good set-pieces first involving elaborate decorations and then Buddy publicly unmasking the fake Santa in front of an army of squealing kids. The final act takes a rather sudden turn away from Buddy's personal story and into a more ambitious let's-save-Christmas agenda. Elf has its heart generally in the right place for the season of good will and needless spending, somewhere between obviously manipulative and harmlessly funny.